Set during World War II, one of the most conflicted and volatile times in American history, Hotel on the Corner of Bitter and Sweet is an extraordinary story of commitment and enduring hope. In Henry and Keiko, Jamie Ford has created an unforgettable duo whose story teaches us of the power of forgiveness and the human heart. The Book Cellar is teaming up with Bernie's Book Bank for the 1st Annual Book Lovers' Lunch Chicago! Join us at 11 a.m. at the Union League Club of Chicago for lunch and a presentation/book signing by special guest Jamie Ford, New York Times-bestselling author of Hotel on the Corner of Bitter and Sweet and Songs of Willow Frost. Click here for ticket pricing and registration details! Join New York Times bestselling author Jamie Ford for an afternoon discussion at the Willows Inn on Lummi Island. Jamie will talk about his book, Songs of Willow Frost, newly released in paperback, and will also share some of his favorite authors and books to read. Stay to enjoy dinner at the Beach Store Café and informal conversation with Jamie. Starting at 4pm on Wed., April 23rd, enjoy a book discussion with Jamie over his new book - Songs of Willow Frost, which each guest will receive a copy of at the event. After the discussion, guests will enjoy a private dinner together with the author at the Beach Store Café. Cost for this event is $75, and rooms will be available to participants starting at $135. To register for this event, call the Willows Inn at 360.758.2620 or visit their website at Willows-Inn.com. 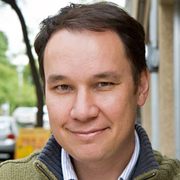 About Jamie Ford: Jamie Ford is the New York Times bestselling author of Hotel on the Corner of Bitter and Sweet, which was an IndieBound NEXT List Selection and a National Bestseller. It was also named the #1 Book Club Pick for Fall 2009/Winter 2010 by the American Booksellers Association. His new novel, Songs of Willow Frost was published in September. And he’s working on a Young Adult series that even his agent doesn’t know about…yet. On the personal side, he’s the proud father of more teenagers than he can keep track of. Yep, it’s chaos, but the good kind of chaos. About Songs of Willow Frost: Set against the backdrop of Depression-era Seattle, Songs of Willow Frost is a powerful tale of two souls—a boy with dreams for his future and a woman escaping her haunted past—both seeking love, hope, and forgiveness. Twelve-year-old William Eng, a Chinese American boy, has lived at Seattle’s Sacred Heart Orphanage ever since his mother’s listless body was carried away from their small apartment five years ago. On his birthday—or rather, the day the nuns designate as his birthday—William and the other orphans are taken to the historical Moore Theatre, where William glimpses an actress on the silver screen who goes by the name of Willow Frost. Struck by her features, William is convinced that the movie star is his mother, Liu Song. Jamie Ford's book Montana Noir was available from LibraryThing Early Reviewers. Jamie Ford's book Songs of Willow Frost was available from LibraryThing Early Reviewers. Jamie Ford's book Hotel Angeline: A Novel in 36 Voices was available from LibraryThing Early Reviewers. Jamie Ford is currently considered a "single author." If one or more works are by a distinct, homonymous authors, go ahead and split the author. Jamie Ford is composed of 3 names. You can examine and separate out names.